It's nearly impossible to be a profitable NFL DFS player over the long term if you're not good at selecting wide receivers. In this article I’ll show you the makeup of a valuable wide receiver, how to identify the top values in a given week, and how to tailor your approach at the position depending on whether you're playing a cash game or a tournament. Let's play a game. I'll give you a stat and where it ranked among the 71 wide receivers who drew at least 50 targets in 2015, but I won't name the player just yet. Based off that stat, you tell me whether the wide receiver sounds like someone who you would usually play or fade in DFS. Let's start with a catch rate of 53.0 percent, which ranked 58th of 71. Sounds kind of risky, huh? How about a touchdown rate of 3.9 percent, which ranked 50th of 71. Doesn't look like he has too much upside, right? Finally, what about 13.49 yards per reception, which ranked 35th of 71. At least it's in the top half, but you're aiming for more than mediocre, no? In order, those stats came from Allen Robinson, Julio Jones, and Antonio Brown. You don't need me to tell you they were all top-six fantasy wide receivers in 2015. Opportunity drives wide receiver fantasy productivity more so than per-play efficiency does. I've said it before and I'll say it again: target targets. Of the 240 games where a wide receiver scored 20 or more DraftKings points in 2015, 85 percent had at least eight targets and 61 percent had 10 or more. Even getting to 15 DraftKings points required eight or more targets 74 percent of the time and 10 or more targets 51 percent of the time. Of the 507 games where a wide receiver drew eight or more targets in 2015, 86 percent scored at least 10 DraftKings points. To be clear, the fact that targets correlate the most strongly with fantasy production doesn't mean you should favor opportunity at the expense of talent. Drawing a target at the wide receiver position often requires considerable skill in getting open (save for screens, forced throws, etc.). In fact, I view target market share as part opportunity metric, part efficiency metric. 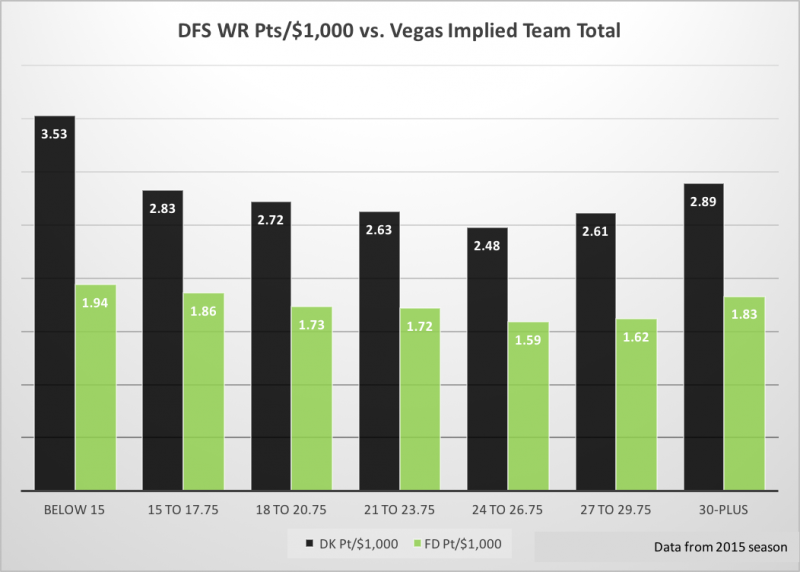 It's rare for a wide receiver to reach 25 DraftKings points or 20 FanDuel points without scoring at least one touchdown, and it requires multiple touchdowns roughly 40 percent of the time. So how do you get touchdowns into your lineup? The most reliable way is to look for wide receivers that are frequently targeted in the red zone, which is where 68 percent of all receiving touchdowns occur. Outside the red zone, only two percent of targets go for touchdowns, but inside the red zone, that figure jumps to 23 percent. The exponential increase in touchdown probability inside the red zone explains the relatively strong correlation for red zone targets per game and red zone target market share to touchdowns to wide receiver fantasy production. Red zone targets are in short supply (teams averaged 4.54 per game in 2015), making wide receivers who receive them extremely valuable. A sharp DFS player will exploit regression to the mean. Understanding touchdown regression goes hand in hand with understanding the value of a red zone target. Wide receivers who haven't been scoring touchdowns are likely to begin scoring more as long as they're getting red zone targets (and their salary may be depressed because of it), while seemingly outlying high touchdown totals are less likely to regress if a wide receiver is getting a steady diet of red zone targets. The numerous intricacies of wide receiver matchups warrants a separate article (if not a book), but in the interest of brevity, I'm going to discuss a way you can exploit cornerback matchups. When determining the best matchups for wide receivers, most DFS players will naturally look at fantasy points allowed to wide receivers. However, this metric cannot always be taken at face value because it does not account for a potential talent disparity between a defense's cornerbacks. Another thing that won't always be reflected in fantasy points allowed to wide receivers is cornerback injuries. As the season wears on, corners will inevitably miss time with injury, and most NFL teams struggle with cornerback depth. As a result, a defense can many times be forced to field a replacement-level cornerback, who the offense will in turn target relentlessly with whichever wide receiver that corner is covering. Of the nine games Alshon Jeffery played in 2015, he was only truly healthy for four -- and what a four-game stretch it was. Jeffery averaged 13 targets, 7.5 receptions, 115 yards, and 0.5 touchdowns last year when completely absent from the injury report. But in the five games that Jeffery turned up on the injury report with various calf, groin, and hamstring injuries, those numbers precipitously dropped to 8.4 targets, 4.8 receptions, 69 yards, and 0.4 touchdowns. A questionable (or doubtful) tag on a wide receiver can significantly hurt a wide receiver's fantasy value. The 15 percent average dip in production is major in a game where you’re trying to squeeze as many fantasy points as you can out of each salary cap dollar. When wide receivers get a probable tag, the type of injury becomes more important. Certain injuries, namely those to the hamstring or knee, aren’t of much concern, while foot and ankle injuries are a far greater cause for alarm. Whereas garbage time doesn't benefit the quarterback position much since quarterback fantasy production is driven by efficiency that will almost certainly be lacking in a game that gets to garbage time in the first place, garbage time can benefit the volume-driven wide receiver position. Consider a situation where a quarterback completes three passes for 50 yards on a prevent defense. For a quarterback, that's worth only two extra fantasy points, but for a wide receiver it's worth either 8.0 (full-PPR) or 6.5 (half-PPR). Keep this in mind when mining for contrarian tournament plays, as wide receivers on teams with low totals tend to be lightly owned. I'll discuss stacking more later, but another implication here is that in games where a team is a big underdog and likely to see garbage time, it might make the most sense to not stack a wide receiver with his quarterback. As you can see, strategy will differ depending on the site. 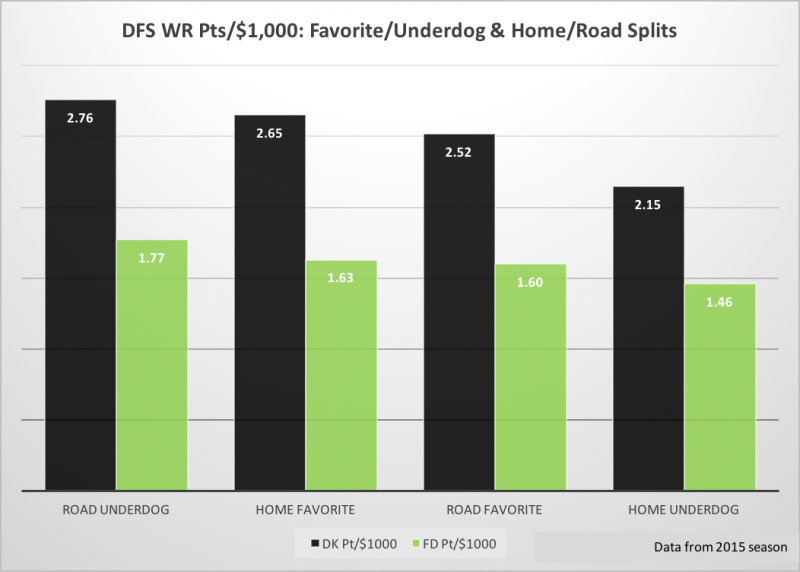 On FanDuel, the stud wide receivers are clearly the safest plays (a playable wide receiver under $5,000 is rare), but on DraftKings, you can use more of a studs-and-scrubs approach. This is likely due to the fact that the full-PPR scoring system on DraftKings makes it easier for a cheap wide receiver to hit value without scoring a touchdown. Given that wide receivers have by far the most upside of any position, and that most DFS lineups require more of them than any other positions, nailing your wide receivers is essential to taking down a GPP -- and you should always be trying to take it down, not just minimum cash. Locking a stud wide receiver in was the foundation of most winning GPP lineups last season. 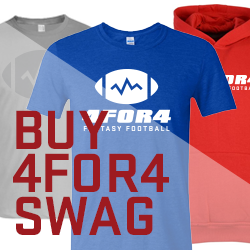 As long as beasts like Antonio Brown, Odell Beckham, and Julio Jones inhabit the earth, it’s a safe bet that in a given week, at least one high-priced WR1 will go off. Winners were also spending up at WR2 -- they’re paying up at the position with the most upside. You definitely want to have some contrarian plays in your lineup to take down a GPP, but the median ownership level for the highest owned WR in a winners’ lineup was over 30 percent on DraftKings and over 25 percent on FanDuel. One chalk play at wide receiver generally won’t stop you from winning a GPP. In fact, it probably helps your chances -- many times a guy like Antonio Brown or Odell Beckham will be the obvious play of the week, and fading a guy like that completely can often end up being counterproductive. As far as stacking goes, the correlation of fantasy points between a WR1 and his QB is the highest of all positional pairings. The correlations of the other wide receivers are roughly one-third weaker, but still among the strongest of any pairings. There is basically no relationship between wide receivers and running backs, which means you don’t need to avoid using a wide receiver and running back from the same team. It’s also worth noting that there’s a slight positive correlation between wide receivers and all members of the opposition's passing game. It’s not something to build lineups around, but if you’re going to have exposure to multiple players on opposing teams in the same games, there’s a slight edge in pairing them up. Targets have a stronger correlation to wide receiver fantasy points than any efficiency metric – emphasize target volume and target market share. 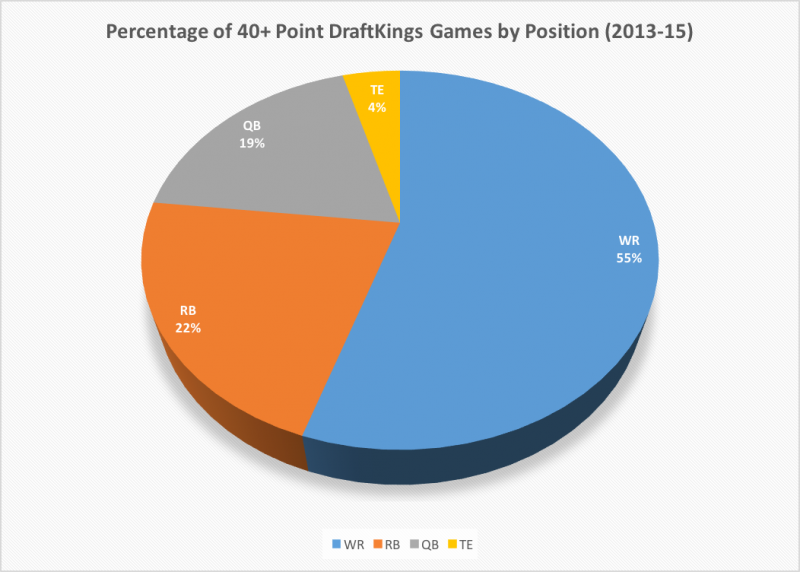 Roughly two thirds of receiving touchdowns occur in the red zone, so red zone target market share is crucial. A wide receiver playing injured will suffer a 10 percent dip in production on average. Wide receivers have the most upside of any fantasy position, so it's essential to pay up for studs in tournaments. One chalk play at wide receiver is generally fine in a tournament.